While lifting weights in the Seldon Jackson College gymnasium on a rainy autumn night, Jaed Coffin heard the distinctive whacking sound of sparring boxers down the hall. A year out of college, he had been biding his time as a tutor at a local high school in Sitka, Alaska, without any particular life plan. That evening, Coffin joined a ragtag boxing club. For the first time, he felt like he fit in. Coffin washed up in Alaska after a forty-day solo kayaking journey. Born to an American father and a Thai mother who had met during the Vietnam War, Coffin never felt particularly comfortable growing up in his rural Vermont town. Following his parents’ prickly divorce and a childhood spent drifting between his father’s new white family and his mother’s Thai roots, Coffin didn’t know who he was, much less what path his life should follow. His father’s notions about what it meant to be a man—formed by King Arthur legends and calcified in the military—did nothing to help. After college, he took to the road, working odd jobs and sleeping in his car before heading north. Despite feeling initially terrified, Coffin learns to fight. His coach, Victor “the Savage,” invites him to participate in the monthly Roughhouse Friday competition, where men contend for the title of best boxer in southeast Alaska. With every successive match, Coffin realizes that he isn’t just fighting for the championship belt; he is also learning to confront the anger he feels about a past he never knew how to make sense of. 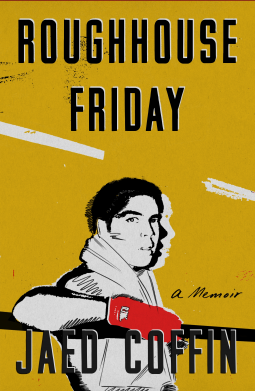 Deeply honest and vulnerable, Roughhouse Friday is a meditation on violence and abandonment, masculinity, and our inescapable longing for love. It suggests that sometimes the truth of what’s inside you comes only if you push yourself to the extreme.